Download the biography of Raoul Lufbery. Download the biography of Ruth Hovey. Download the biography of William Service Bell. Download the biography of Stubby. Download the biography of Edith Rossiter. Download the “Connecticut Heroes of World War I” Chart. “World War I Flying Ace Raoul Lufbery,” by David Drury. ConnecticutHistory.org. 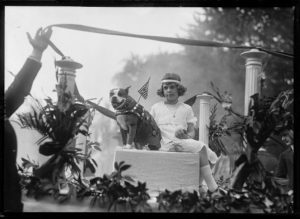 “A True Dog of War: Sergeant Stubby.” ConnecticutHistory.org.